Soak dried shiitake mushrooms in hot water in a large bowl for approx. 30 min. Afterwards, drain but save the soaking water. When soaked, cut off stems from shiitake mushrooms. Toast peanuts in a small frying pan for approx. 5 min. Peel and mince ginger and garlic. Finely chop cilantro roots. Remove seeds from Thai chilis and finely chop. Peel and halve onion, then cut it into fine rings. Finely dice shiitake mushrooms. Slice carrots and bamboo shoots and set aside. Add toasted peanuts, cilantro roots, ginger, garlic,Thai chili, kaffir lime leaves, coconut milk, soy sauce, salt, lemon juice, and soaking water from shiitake mushrooms into a blender and blend until smooth. Add smooth coconut mixture and vegetable stock into a large saucepan, stir to combine and bring to a boil. Reduce to low-medium heat. Add chopped red onion, shiitake mushrooms, carrots, and bamboo shoots to soup and simmer for approx. 10 min. Add spinach to soup and let it soak for approx. 5 min. over low heat. Soak rice noodles in hot water, according to package instructions. 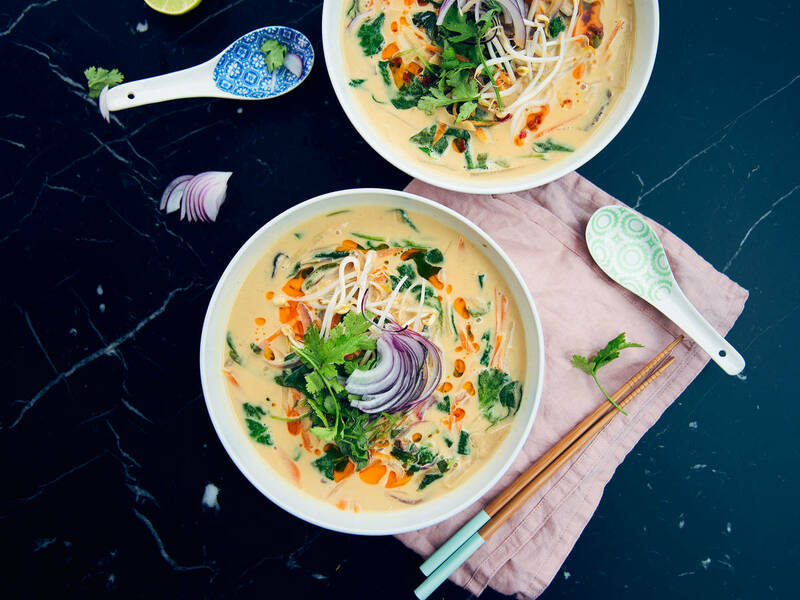 Drain rice noodles and add noodles to soup, along with cilantro, soy sprouts, and chili oil. Serve with lime to drizzle on top. Enjoy!